When we last sampled and reviewed a selection of Friendly Soaps last year, we were enamoured by not only how good the soaps were and how lovely they smelt but were mighty impressed with their ethical credentials too. They use as little energy as possible throughout production and pack every bar of natural handmade soap using human power alone. They also use only the finest and purest of natural ingredients so no harsh lathering agents or colours or chemicals are added. This year the team at Friendly soap have added two new soaps to their range, a Travel Soap and a Hair & Body Bar. 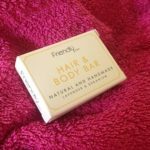 The Hair and Body Bar is a two-in-one soap and perfect for after the gym or swimming as it lathers well and smells gorgeous. I adore lavender in all forms so the fact that it’s scented with lavender and geranium was another plus. The Travel Soap is a three-in-one as it’s suitable for hair, body and shaving. 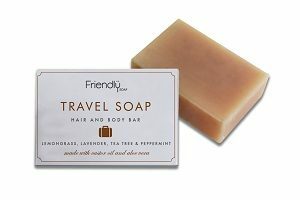 If you’re planning on camping or backpacking or simply want to travel light then this soap is perfect. It’s made with lemongrass, lavender, peppermint and tea tree oils and is naturally moisturising. Friendly Soaps are members of the Vegan Society and Buav (Cruelty Free). You can view the Friendly Soap collection on their website here. Each 95g bar of soap retails at £1.99 and their beautiful ethical gift sets for men and women start at £11.59 They are also stocked at Goodness Foods, Rainbow Wholefoods and The Health Store.